Why did Titus build a Congregational Church? Salt’s paternalism and strong Christian faith led him to support construction of two churches in the village to ensure his workers could worship within the boundaries of Saltaire itself. The United Reformed Church, originally called the Congregational Church, was built on a prime piece of land facing the mill entrance. Construction began in 1858 and was finished in eight months at a cost of £16,000. Many people have noted the deliberate symbolism of the building’s proximity to the mill, as if to remind staff of their moral obligations. Architecturally the most distinctive building in Saltaire, the church is grade 1 listed. Its design borrows heavily from classical style, with a front tower supported by six Corinthian columns holding up a strikingly ornate belfry. In 2003 current mill owner Maggie Silver donated a new ring of bells in memory of her husband Jonathan. These were dedicated during the first Saltaire Festival and are rung regularly by a dedicated team of volunteers. For many the return of change-ringing brings an audible sense of heritage back to the village. Inside the entrance is a bust of Titus, dating from 1856, paid for by his workers as a mark of respect. In keeping with Congregational tradition there is little religious imagery and the pews are of simple design. However, the fittings were made by some of the finest craftspeople of the day; the chandeliers are by Hausburg of Liverpool and the organ was made by Holt of Leeds. The church had a capacity for 600 worshippers. There is also an elevated private balcony at the rear. A mausoleum was added after the death of two Salt family children (Whitlam and Mary) from scarlet fever. As time went by the remains of other family members were buried here including Titus and Caroline Salt. The only other Congregational Church in the UK with a mausoleum and a ring of bells is in Port Sunlight, created by another congregationalist entrepreneur, William Lever. What was distinctive about Saltaire’s houses? Titus Salt provided housing around his new mill to bring workers out of crowded urban tenements into a cohesive settlement with a range of facilities to enrich daily life. Houses were built in phases on a grid pattern of streets. While maintaining substantial architectural uniformity, their staged construction allowed for more subtle elements of design to suit changing needs. The first houses were built on Albert Terrace, named for the Prince Consort. It runs east-west above the railway line and is the only street to retain cobblestones. The majority of streets were named for eleven of Titus and Caroline Salt’s children, seven daughters-in-law and grandchildren. Two others were named after village architects Lockwood and Mawson. The later additions of Daisy, Myrtle and Fern Place were nods to popular plants and flowers of the period. One popular misconception, owing perhaps to its poetic symmetry, is that the two largest streets after Victoria Road were named for the village founder and his wife. Consensus now suggests that Titus did not give his own name to a particular street. Titus Street is named for his fifth son, Titus Salt Jr. The size of house workers were able to secure normally was dictated by family size and contribution to the workforce, rather than by job status. This integration did much to promote good relations within the community and alleviate class tension. Working for voluntary organisations like the fire-brigade was also a route towards more comfortable accommodation. A few large dwellings were intended as boarding houses for lone workers. These were unprofitable, as many single people preferred to sub-let rooms from friends in the village. Eventually the houses became single-family dwellings, much sought after today because of their size. The first houses were of two main types, built on six streets running north-south between Albert Terrace and Caroline Street. William Henry Street and George Street had larger properties costing approximately £200 (£12,000) each to build. They typically had three bedrooms, a living room with a cooking range, a scullery kitchen and a small cellar. They had a front garden and were set back from the road to allow privacy. Amelia, Edward, Herbert and Fanny streets held smaller houses costing around £120 (£7000) to build. These were plainer in design with no gardens or cellars. They also tended to only have two bedrooms of which only one had a fireplace. This was high quality provision for the 1850s but there were restrictions to preserve the design aesthetic of the village. Most notably, although Titus preferred ‘through terrace’ housing, a handful of tiny houses were built at corners on Titus and Caroline streets to conceal the back yards of the side streets. Most of these houses have been demolished, but few examples remain such as 20 and 21 Caroline Street. Small streets running north-south between Caroline and Titus streets were built in the second phase, completed in 1857, e.g. Whitlam, Mary, Helen and Ada streets. Their primary additional benefit was a cellar. All the remaining streets were part of the third phase, completed in 1863. These houses were virtually identical to their predecessors but with a more generous plot, a third bedroom and a substantial cellar. These streets had a change of orientation to run east-west, improving their visual appearance from the Leeds Turnpike. Completed in 1868, housing on Albert Road includes long terraces, blocks of four and semi-detached pairs. Some houses were intended for higher status occupants: mill overlookers, teachers, doctors and church ministers. They have significant architectural details, front gardens and, when built had a view across fields to Nab Wood. No. 1 was the largest house in the village, tied to the role of chief cashier. Appropriately it is now a building society. In the 1870s two schools that now block the aforementioned view (Albert Road Board School and Saltaire First School) had to be built in the highest quality stone to ensure that they blended in architecturally. Despite changes in layout, all houses had a back yard and outbuildings to use as ash pits, coal stores and privies. The ‘through-terrace’ design allowed light and air indoors and kept waste at the back where night-soilmen could collect it. Beyond Exhibition Road to the east are three streets which were not part of the original design. Maddocks Street and Rhodes Street were named for 1893 syndicate members who bought the mill with James Roberts. These two, and Baker Street, are sympathetic later additions and are a key part of the World Heritage Site’s “buffer zone”. What is the significance of Roberts Park? In 1871 Salt added 14 acres of parkland designed by William Gay to enhance well-being and encourage sport among his workers. The area was landscaped to include a grand terrace for locals to ‘promenade’, a bandstand for outdoor concerts, a cricket pavilion and gardens filled with popular trees and plants. Park rules were fairly punitive by modern standards (no children under 8 years without parents, no dogs, no touching the plants, no swearing or gambling), but this was a showpiece to be preserved and enjoyed by all. Space was included for cricket, bowls, croquet and archery. Salt made efforts to widen and deepen the river in 1871 as it ran through the park, to accommodate bathing and boating (a popular pastime with locals). The pub on the riverbank still bears the name the ‘boathouse’ to mark this activity. Building the park and improving access to Shipley Glen (via the Glen Tramway!) was intended to offset the lack of public space within the village itself. In 1920 Sir James Roberts gave the park to the local authority to be held in trust for permanent leisure use. A magnificent restoration, costing £4.5 million from the Heritage Lottery Fund, was completed in 2010 by Bradford Council in co-operation with the Friends of Roberts Park. What was the original purpose of Victoria Hall? Adult education was an area of significant interest for Titus Salt. In 1869 he commissioned the magnificent Saltaire Club and Institute (now known as Victoria Hall) to inspire learning throughout his workers’ lives. Designed by Lockwood. & Mawson, the building rivals the Church as an iconic structure. It was completed in 1871 at a cost of £25,000 (£1.3 million today). It is flanked by streets named after its designers. The building contained recreational rooms for billiards, chess and draughts. The main hall with its original balconies on three sides could seat 800. A library, art studios, classrooms and a gymnasium were also part of the design. There was even a drill room and firing range for the 39th West Riding Volunteers. Titus intended to supply the ‘advantages of the public house without its evils’. Democratically run and inexpensive to join, the Saltaire Institute became a meeting place for numerous clubs and societies. It was the venue of choice for concerts, theatrical performances, political rallies and grand events such as the annual conversazione. Held in trust by the Salt Foundation, Victoria Hall was leased for decades to Shipley Urban District Council and then Bradford Council. It held the main library for Shipley, and kitchens preparing meals for many schools. The gymnasium was well-used for gymnastics and other sports training. Victoria Hall is managed now by Shipley College on behalf of the Salt Foundation. In its long history the building has survived many transitions and never closed. With a small staff it hosts a wide variety of social and educational activities. Its colourful, spacious rooms are popular choices for civil weddings. What was the Factory School? Successive factory acts in the 1830s and 1840s had established reduced hours and the legal obligation to provide education. Bradford born Richard Oastler, amongst others, sought to overcome the use of child labour and ensure a better future for the nation’s youth. Titus Salt embraced this whole-heartedly and built the Factory School on Victoria Road in 1867 (now part of Shipley College). The school had a capacity of 750 children, most of whom were half-timers at the mill. They worked shifts: 6am-12:30pm one week and 1:15-5:30pm the next, and their schooling fitted in around this rota. The school quickly became regarded as one of the finest in the district. It was well equipped and had playgrounds at the rear. Caroline Salt shared her husband’s passion for education; her initials as well as his are carved on the pediment of the Factory School. She was hugely influential alongside W.E. Forster in establishing Salts Grammar on the Baildon side of the river Aire, offering full-time education to children across the district. Why does Saltaire have its own lions? Outside the Factory School and Victoria Hall in what was known as Victoria Square sit the now famed Saltaire Lions – named War, Peace, Vigilance and Determination. It has to be said that the names were not given by Titus but by their sculptor Thomas Milne. The lions themselves were originally intended to sit at the base of Nelson’s column in Trafalgar Square. It is said that they were rejected because their size failed to match the grandeur of that site. Titus however, had no such problem with them and their sale was swift. What was Saltaire Hospital like? Saltaire Hospital was originally a 2-storey building completed in 1868 as a casualty and convalescence ward for accidents in the mill. Allegedly, it began as one ward with six beds. Its development into a three-ward infirmary with surgical theatres and a further 18 beds came in response to the needs of the local community. Sickness benefit societies were also established with workers paying a percentage of their wage as insurance to offset potential illness or accident. It would be almost half a century before this practice was established nationally. Building extensions in 1908-9 and 1925 can be seen in the photographs (darker stone indicates the original scale). On both occasions care was taken to ensure the original roof and monogram crest were retained. It served the people of Saltaire until 1979 after which it became a retirement home for a short time. Since 2001 it has been private apartments. Why was space given to allotments? The allotments that run alongside the railway were always part of the village plan. Titus supported the cultivation of this land for food and development of gardening skills as this was a positive activity for his workers, with obvious health benefits. The area gave rise to a very popular Horticultural Society, formed in 1861. Pigs, dogs, poultry and pigeons were also kept on the site. These original allotments are administered by Bradford council. Further allotments behind the church were created alongside sports facilities during the 1920s. The land is owned by Hartley Properties, and the allotments are run by the Canalside Allotments group. Current interest in growing food is evident in waiting lists for both sets of allotments and the use of planters in Wash House Garden and in the corners of the Caroline Street car park. Veg on the Edge volunteers play an active part. This distinctive building opened in 1863, costing around £7000. It was meticulously planned to benefit the health and comfort of village residents. There were private facilities for men and women (12 baths each), a Turkish bath, and a well equiped wash house. Sadly, it did not prove popular with the local inhabitants. This may have been due to the small entry charge, but perhaps also the increasing preference to wash/bathe at home in private. The unprofitable building, despite its grand design and progressive purpose, closed in 1894. Like many other large buildings in Bradford at the time, it was converted into worker’s cottages before eventual demolition in 1936. Saltaire residents canvassed opinions about use of the site and, with support from Bradford Council, a community garden was created in 2011. It is maintained by local volunteers. Saltaire Station was completed in 1858 although specially chartered trains had been arriving on the existing line from Bradford since the mill opened in 1853. The original buildings were a ticket office and waiting room which had design elements in keeping with the village’s Italianate style. In addition to the station there was a siding with a series of turntables built into the tracks. This allowed individual carriages and wagons to be de-coupled and raw materials/finished goods to be dealt with swiftly, without affecting the passenger line. It was a truly bespoke solution for the site’s unique location. Saltaire station closed in 1965, a victim of Beeching’s cuts, and the building was demolished in 1970. The larger station in nearby Shipley was seen as a suitable alternative. 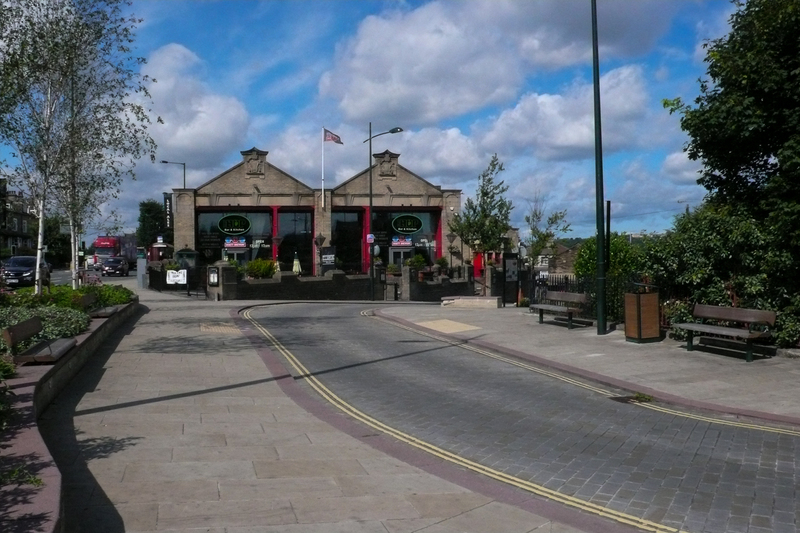 Within 20 years this decision was reversed, and the renewal of passenger traffic was a key factor in Saltaire’s recovery. This opened in 1868 as a Wesleyan Methodist Chapel, and was another of Saltaire’s original showpiece buildings. Built on the Shipley-Bramley Turnpike it had a very grand exterior designed by Lockwood and Mawson. Its construction was approved by the Salt family on land they donated to mill staff. As the Salts were Congregationalists, they did not commission the chapel. It was built following a programme of subscriptions endorsed by Titus. The Wesleyan Chapel had structural problems and was replaced by a more functional building in 1970, according to normal practice in the Methodist Church in the UK. Today it is in regular use by many community groups. This very impressive building was constructed on a prime site originally intended for a grand hotel, on the corner of Victoria Road and Caroline Street. In 1875 Salt gave the site to the Congregational Church to enable the building of a Sunday School. As a congregationalist himself, he supported the construction costs, providing £7000 of the £10,000 total. The contract was again won by Lockwood and Mawson. This was the final large-scale construction in the village during Titus Salt’s lifetime. It opened in 1876. Inside, the school was generously proportioned: an assembly room with a capacity of 800 and 22 classrooms surrounding it. Preparation for a well-balanced, moral adulthood was a central aspect of the school’s teaching and a high standard of behaviour was expected from all pupils. There were many lively activities such as concerts, walks, and games of billiards. The Sunday School was demolished in 1972 and not replaced. The site provides car parking and space for a monthly Farmers’ Market. Two of its corners are used by ‘Veg on the Edge’ to grow flowers and vegetables. Schools of Art and Science established in Victoria Hall (Saltaire Club and Institute) grew so rapidly that more space was needed. Titus Salt Jr. decided to mount a Royal Yorkshire Jubilee exhibition which would pay for the cost of a new building. The exhibition saw grand installations around the village and a royal visit by Princess Beatrice. The exhibition, although successful in many ways, barely covered its own costs. Nonetheless, Exhibition Building was constructed in 1887 and stands today on a road of the same name. It is another reminder of the Salt family’s strong commitment to education, and in particular the commitment of Titus Jr. who died not long after its completion. It is held on a long lease by Shipley College, which provides further education for young people and adult learners across the district. The first row of 11 shops was completed in 1854 on Victoria Road, including a post office which is now Saltaire Canteen. 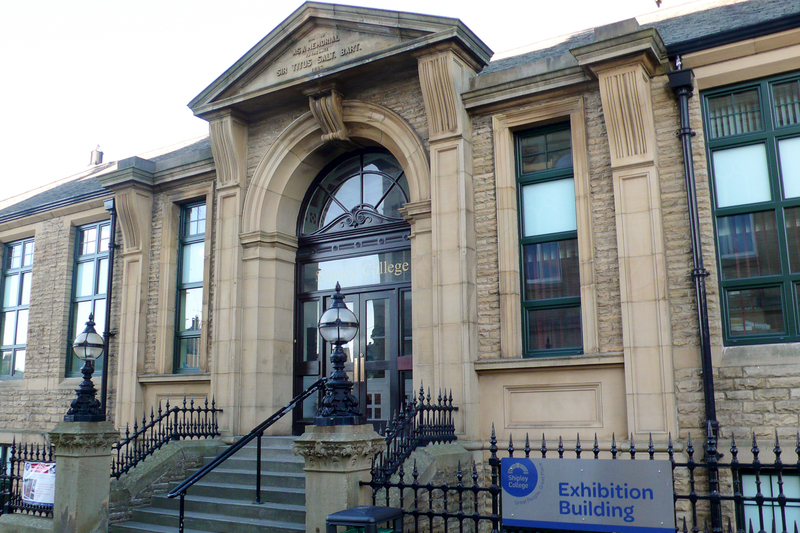 In the 1860s this site was the first home of the Saltaire Literary Society & Institute, with a Library and Reading Room freely available to all in the village. Titus took a personal interest in the village shops and personally vetted all tenants. Notably absent were public houses. Whilst not a tee-totaller, Titus regarded pubs as a bad influence. He provided no land or money to something that would divert the attention of his workers or detract from the productivity of his business. Despite his attitude, nearby land was available and local entrepreneurs were quick to take advantage. The Rosse Hotel is the oldest public house in Saltaire, licensed from 1870. There were also over 30 pubs in neighbouring Shipley. Gordon Terrace, now part of Bingley Road, was constructed on the Bradford to Keighley Turnpike. It represents the southern boundary of Saltaire. Originally, it was built with only two shops, one at either end, with a row of conventional houses in between. The houses had a pleasant view across open fields beyond the road until the other side was built in 1880. As the road became more heavily used and the village expanded, it became less attractive for residences and more beneficial as an expanded shopping area. Saltaire tram shed was commissioned by Bradford Corporation Tramways in 1904 to house the newly designed electric trams. Steam trams had run with increasing success since the 1880s along the Bradford Road. The new tram shed at the end of Gordon Terrace could hold 30 cars. It was used for trams until the outbreak of World War II, then for trolley buses and later more modern motor buses until its closure in 1978. The building is now a popular pub/restaurant called ‘The Hop’. Bradford has a claim to fame as both the first and last city in the U.K. to operate a trolley bus service (one of the last trolley buses is exhibited in the Industrial Museum). Although the site is a mile or so from the village, many visitors to Saltaire have heard stories of the former mansion of Milner Field near Gilstead. It was built as a gift for Titus Jnr on land purchased by his father in 1873 towards the end of the building programme of Saltaire. Designed by Thomas Harris, it was described as a ‘Wagnerian Gothic Retreat’ and certainly made an imposing landmark. Milner Field had a short life, despite the cost of £21,000 to build the house and construct its 45 acres of private gardens. The house developed a very disturbing reputation. Deaths of various owners, including Titus Jr. himself led to stories of hauntings and curses. Despite this, various managing directors of the mill made it their home until the 1920s. Milner Field’s chequered history ended with demolition in 1950 following 20 years of dereliction. Due to its unfavorable reputation no buyer could be found. The two gatehouses remain, one at the Saltaire end of the property, and the other higher up at Gilstead. Other traces are an archway that once led to the rear courtyard, and brick walls of the extensive gardens.